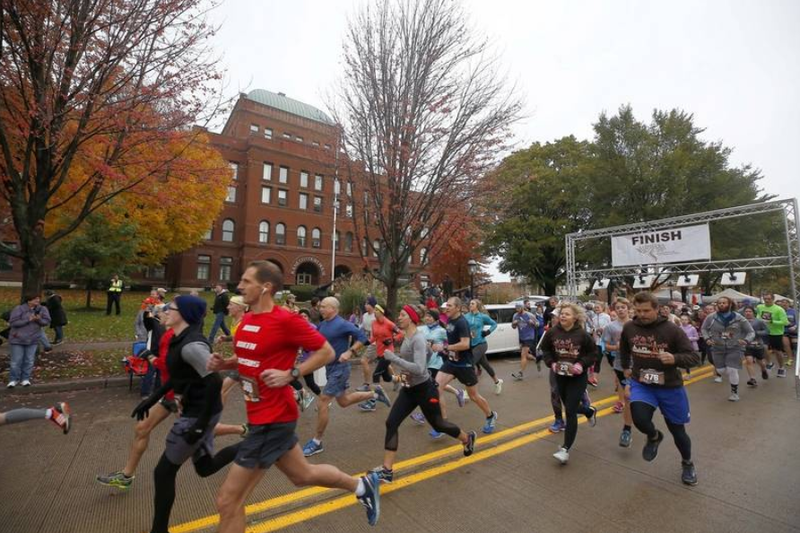 Participants embark on their 13.1 mile journey. Nov. 4, 2018. Long after the spikes were taken out of their racing shoes and their uniforms were returned to the school’s basement cages, seniors Claire Libert and Delani Kazmierczak were out on the Prairie Path putting in miles in preparation to run a half marathon. 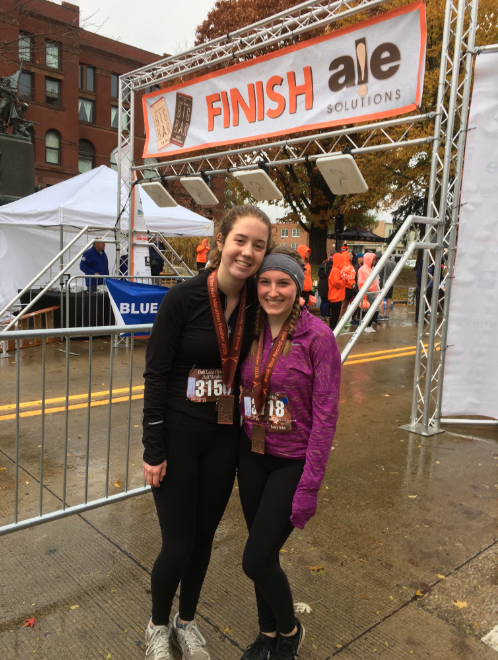 13.1 miles is no easy feat, but with the dedication that these two girls put it, they were able to run one with just a few weeks of training after the regular cross country season ended. 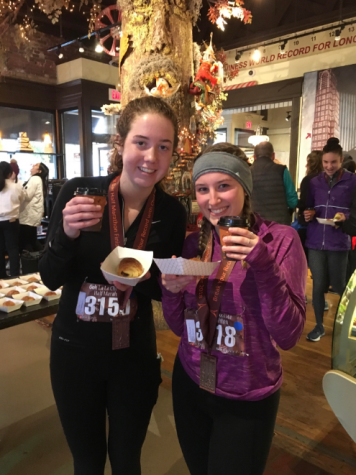 Libert and Kazmierczak came up with the idea to continue their cross country training in the middle of their season after volunteering for the Bank of America Chicago Marathon back in Oct. and seeing both elite and regular runners take on the daunting 26.2-mile race. Seniors Delani Kazmierczak and Claire Libert pose with their medals in front of the finish line minutes after completing their race. Training for the half took a lot of mental strength and perseverance. Each day after school, the girls met at the path and embarked on runs that added up to 10 miles, far longer than any long run they completed during the season. Before the race, the girls dealt with the pre-race jitters and anxiety, feeling as if they weren’t prepared enough or that they weren’t going to be able to run the entire time, which continued with them throughout the first few miles of the race. Kazmierczak and Libert faced obstacles and challenges, such as being tired from attending the state meet the day before and dealing with intense leg pain as they climbed over hills, but they persevered and were determined to finish the race. Just like in their training, the race was both physically and mentally challenging, but with the workouts under their belt from the cross country season and the support of their families and the other runners around them, the girls ended up running the entire race and finishing with a time of 2:02. After crossing the finish line and feeling the warmth of the cup of hot chocolate in their hands contrasting with the cold hard medal placed around their necks, the girls were in shock, but ecstatic that they had just completed a half marathon. Seniors Delani Kazmierczak and Claire Libert show off the hot chocolate and chocolate croissants they received as a congratulatory gift from the chocolate-themed race. 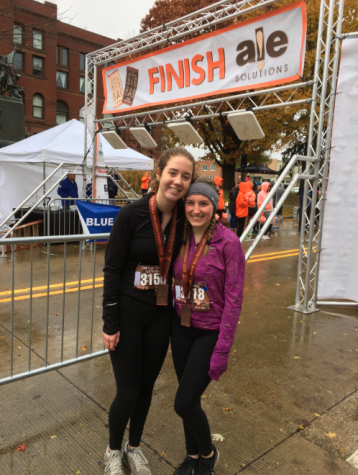 After the lactic acid had drained from their legs and feeling started to return to them, the girls reflected back on their experience and both came to similar consensuses, running another half marathon would not be in their near futures.